Mosque of Uqba - The three most holy sites in Islam are all well-known, being mentioned even in modern times because of their locations. They are the Masjid al-Haram in Mecca, the Al-Masjid al-Nabawi in Medina, both located in Saudi Arabia, and the Al-Aqsa Mosque in the Old City of Jerusalem. Have you ever wondered what the fourth most holy site is? 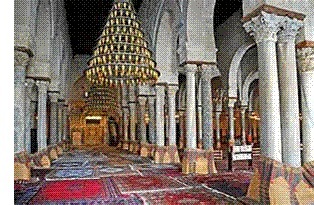 (because I have) Well it's the Mosque of Uqba in Kairouan. It's important to point out that the Al-Aqsa and Uqba mosques are both Sunni temples, which tend to place greater emphasis on how holy a site is. The Masjid al-Haram, which is the center of the Hajj, and the Al-Masjid al-Nabawi, which contains the tomb of Mohammed, are sacred to all Muslims, Sunni and Shia. The significance of the Uqba Mosque is that it was built by Umayyad general, Uqba ibn Nafi, who conquered western North Africa, a region known in Islam as the Maghreb. First built in 670 (that's 21 years older than the Dome of the Rock - see above), it is also one of the oldest still standing (rebuilt in 863) mosques in the world. It was the first mosque built in the Maghreb and all subsequent temples built in the region from that time were modeled after it. In fact, the town of Kairouan, where it is located, was built around the site.